The CompTIA Cloud+ course will teach the student about Cloud concepts and models, resource and systems management, virtualisation and keeping their organisation’s Cloud-based operations secure. The course will also cover infrastructure and business continuity. Businesses that have moved their operations to the Cloud enjoy the benefits of increased security, greater operational agility and greater competitiveness over competitors. Work can be done from anywhere, seeing as employees can access the Cloud from anywhere with a reliable and secure internet connection. Documents can also be collaborated on by multiple users at the same time, negating the need for the same document to be sent back and forth between employees, saving valuable time. A lot can also be said for the advantages of Cloud-based data backups and –recovery. These are always available to be accessed in the event that they are needed and, hence, ensure that you are fully covered in case of a disaster. The servers that host an organisation’s Cloud-based operations are usually kept off-site, which means that any maintenance that needs to be done is handled by the suppliers of those servers. This frees up a lot of time in which to focus on the running of the business, rather than worrying about servers. It also means that any software updates that are rolled out will automatically be applied to your system, keeping it in line with the latest features. These will often also include security updates that will ensure your data is as protected as it possibly can be. The CompTIA Cloud+ qualification comprises of one exam and it is necessary to complete the training and pass the related exam in order to gain your internationally recognised CompTIA Cloud+ certification. 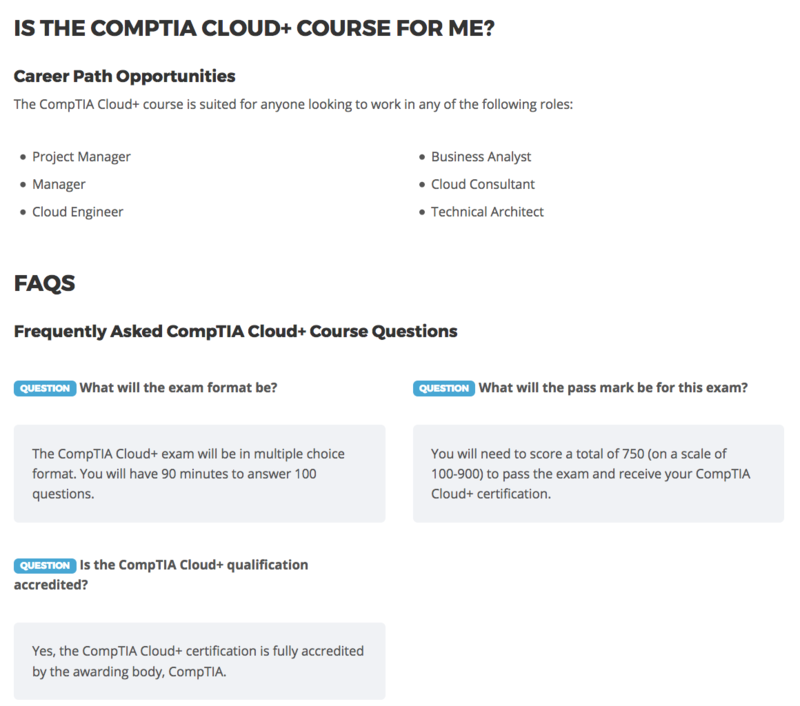 There are no prerequisites for studying CompTIA Cloud+, however, it is highly recommended that you have 24 to 36 months of work experience in networking, storage or IT data center administration.